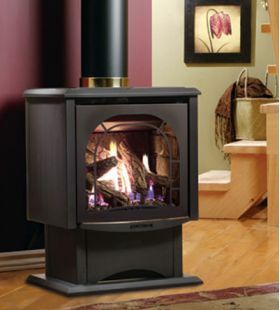 The FV200 B-Vented model (4" B-Vent) is particularly well suited for replacement of wood stoves as it can utilize the existing wood stove chimney. The unit has a spill safety switch, which will shut down the appliance in case of a blocked flue or downdraft occurs. These units usually stand away from the wall and are an excellent option when replacing a wood burning stove as you are able to use the existing chimney. Uses air-cooled pipe (B-vent), or gas flex liners to vent appliances. These types of appliances use room air for combustion and exhaust through the B-vent pipe or flexible gas liner. Vented appliances are not as restricted in venting length as compared to direct-vent appliances and can utilize existing chimney systems by running a gas flex liner into existing chimneys and terminating with a raincap and flashing.